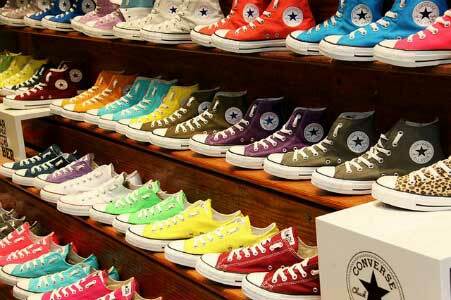 Chucks diversified in the late 1960’s from the original black and white models. They may not rank quite as high as baseball or Mom’s apple pie, but Converse All-Star basketball shoes have always been all-American, ever since they were introduced in 1917. Named after a traveling salesman, the “Chuck Taylor” first appeared in 1922 and has been embraced by everyone from athletes to punk rockers, from Wilt Chamberlain to the Ramones. Originally available in two colors — black and white — Chuck Taylors began diversifying in the mid-’60s, adding dozens of new models in neon-bright colors and inventive patterns. Almost every generation has adopted the Chuck Taylor as its own. to visit prisoners in the state penitentiary. “When I was growing up in Floresville, a small town south of San Antonio, we all wore them. They were cheap: five or six bucks. You could get gray, black, red — not as many as you can choose from right now. I kept on wearing them — even when I was stationed overseas in Germany, I’d have my mom send me some. “I still wear them. I got three or four pair. I got the high-tops, the ’mids’ — in between a regular sneaker and a high-top. I got two sets of black, I got blue, I got red, I got white. Some of them are pretty old and they’re still in real good condition. That’s why I buy them, they last a long time. “I wear low-tops. I have two pairs: blue and a pair I’ve had since 8th grade that are maroon and gray-flannel plaid. I just can’t throw them away. They were cool in my school, among my crowd, which was the freaks and the skaters, the people who were really into music and art. I had always worn Vans up to that point. I found a pair on sale for $14. They were really cool and I had to have them. “I’d heard they weren’t going to make them at all, but I went to the Web site and learned they’ll continue making the shoes, but not in this country. If it’s slave labor, I’ll have to quit wearing them. “I have at least 40 pairs. I’ve had a lot of them forever. I’ve always had the different colors for whatever occasion. For dates, I’ll wear the solid black ones — the ’tuxedo’ ones. I have a couple of pairs that look like American flags; I wear them on July 4th, always. I have one khaki pair with pockets on the side. The Christmas ones get the most comments. “I wear white ones when I go to a UT (University of Texas) game, since their colors are orange and white. I have a pair of camouflage I don’t wear too much. I haven’t seen another pair like that in 15 years; I guess I want to save them. “I keep them hanging around in a couple of rooms. They hang from the ceiling on little hooks that I can reach. It started out just as a space thing but then I thought it looked pretty cool. They don’t hit my head. “I bought my favorite pair when I was in college. I went to Texas A&M, which was very conservative. So I kind of stood out; that hasn’t changed. They were the Christmas Chuck Taylors — red and green plaid with jingle bells on the back. I thought they were the coolest things I had ever seen and had to have them. “The colors were always a big deal — hot pink, yellow and black and orange. I’ve even seen polka dots. I think that was their main draw. “Where to begin? In high school in the early ’70s, I had two pair, one orange, one black — my school’s colors — with laces the opposite color. The thing to do was to wear so many pair of socks that the shoes would fit tight without being tied.